Between today's towns of Pedreguer, Gata, Lliber and Ondara, in the central part of the Marina Alta, was once a small Islamic administrative district - the hisn of Ocaive. The 13th century Llibre del Repartiment (land distribution document) notes five farmsteads and one rahal (rafal *): Benimazmuth, Cannellis, Carracha, Gorgo, Pedreger and the Rahal Abenaxochi. 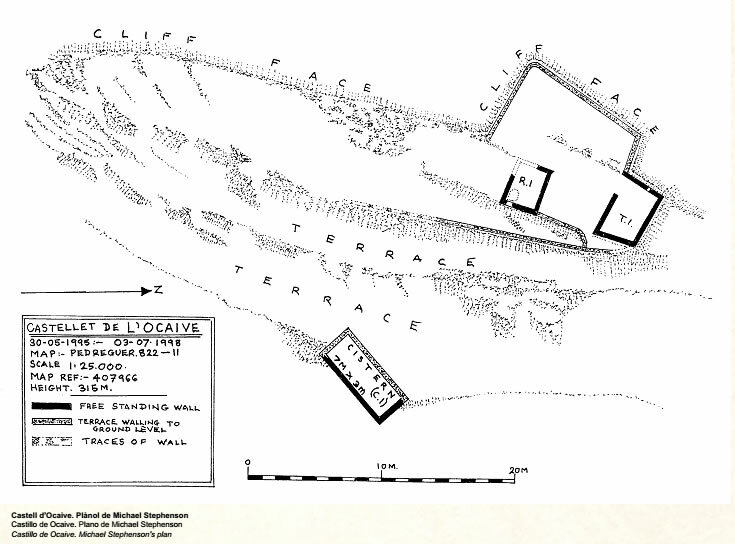 These names combined with archaeaology have enabled the location of almost all these settlements, in some cases there are architectural structures and other physical evidence. 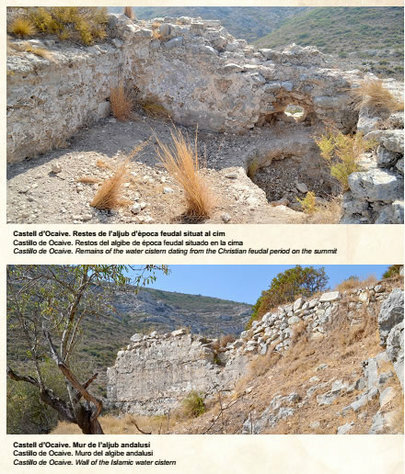 To the south is the farmstead of Cannelis - now known as the Barranc de Canela, as well as that of Gorgo,which probably corresponds to the remains of a settlement located on the northern edge of the Gorgos (Jalon) river . To the north, from east to west, there is the farmstead of Carraca, currently between the municipalities of Pedreguer and Ondara; Pedreguer (the current town of Pedreguer); and Benimazmuth, today's area of Benimarmut. The location of Rahal Abenaxochi is more problematic. 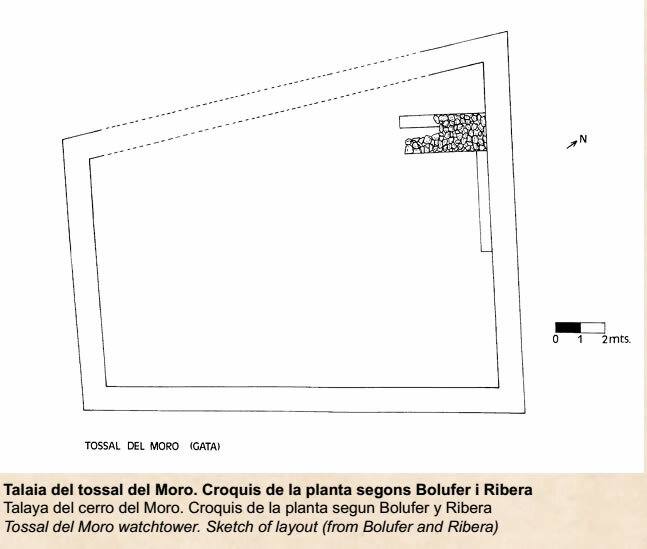 It could be in today's area of Rafalet to the northeast of Pedreguer district, or at Font d'Aixa (Aixa spring) which appears in post conquest documents as the farmstead of Benaxar. Ocaive Castle is located on the top of a rocky pinnacle at an altitude of more than 300 metres. 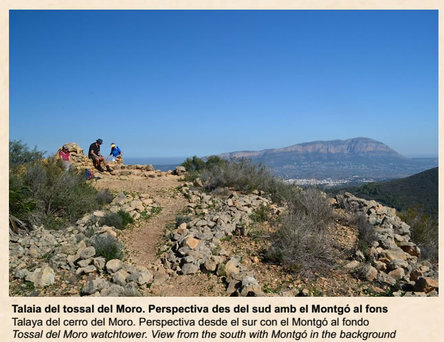 From here it dominates and controls the natural corridor of the narrow Llosa valley through which once passed the road linking the territory of Dàniyya (Denia) with the south. Most of the architectural remains of the castle are located on the summit. There are remnants of the walls of a square tower, which originally would have had two floors, with a south-facing door. A few metres towards the south lies another square structure, originally covered with a barrel vault, which corresponds to a water cistern. 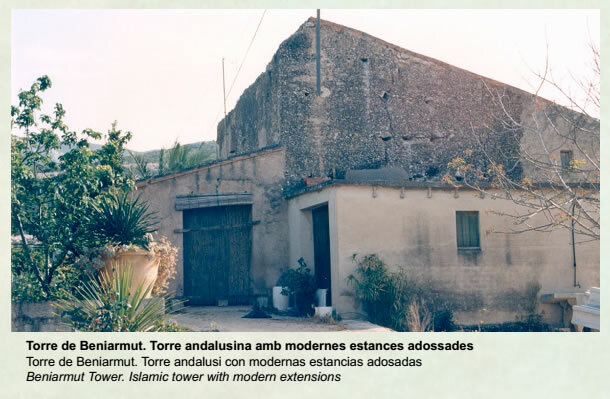 Just two kilometers northeast of the castle, in a flat agricultural area, is the tower of Benimarmut, a robust rectagular building made of a tapia of lime mortar and stones, which has been re-used as a farmhouse. The modern modifications lopped the top off the tower - the current height is 6 metres - and destroyed the south wall. The original floor of the building would have been 10.5 metres north-south and 6 metres east-west. This tower can be considered as a building from the late Islamic era, having a defensive and control function linked to the Benimazmuth farmstead. 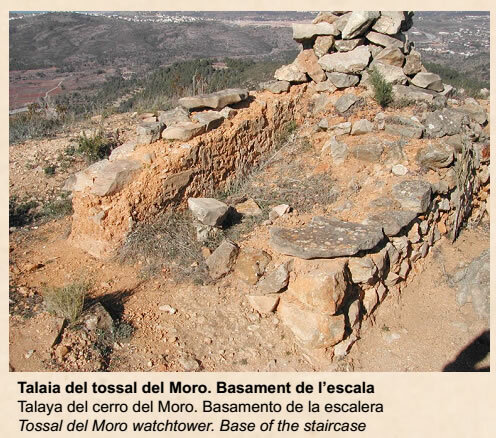 The last defensive structure of the Ocaive hisn is about 5,300 metres southeast of Ocaive on the apex of the Tossal del Moro at an altitude of 389 metres. This peak has a panoramic view of territory extending from from the Xàbia valley to the North to the Benissa lowlands to the south. The Barranc de Canela lies at the eastern foot of this tower ( see Cannellis farmstead, above). 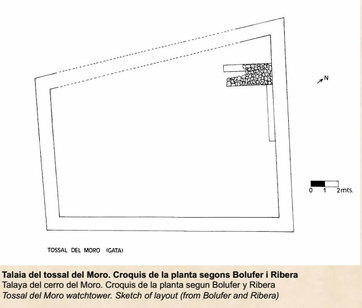 That which remains are the foundations of a trapezoidal structure: 18.20m x 15.20m x 17.70m x 10.70m built with stone masonry bound with mortar, plastered both inside and out. The maximum residual height is 1m. Inside there is a small bench attached to the north wall. This is also of masonry and perpendicular to the wall indicating that it may be the foot of a staircase. ​The archaeological material recovered from the site date the tower from between 12th and early 13th centuries.